Adani Group is a diversified conglomerate, with interests in various activities including Power, Infrastructure, Global Trading, Logistics, Energy, Edible Oil refining and infrastructure projects and services. The business areas under the flagship businesses are Energy (Power Generation, Power Transmission, Coal Mining & Trading, Power Trading, Oil & Gas Exploration, City Gas Distribution), Agro (Edible Oil Process & Marketing, Bulk Grains & Pulses, Controlled Atmosphere Storage Units, Grain Silos & logistics) and Infrastructure (Ports, Special Economic Zone, Logistics, Inland Container Depot, Real Estate). Gautam Adani is a self made entrepreneur and he was kind enough to share his insights on the direction of infrastructure investments in India and his plans for Adani to take advantage of hypergrowth in this sector. Can you explain the concept of SEZ? Why was Mundra Port converted into an SEZ? How is it different from SEZ’s in countries like China? SEZ’s are designated areas or conclaves with special economic regulations. They are Conducive to foreign direct investment. Companies like the concept of an SEZ since they receive tax incentives and the opportunity to pay lower tariffs. Cluster of Infrastructure: Port for international connectivity, road, rail and pipeline connectivity to domestic markets. Power Potential: 8620 MW power to be generated by Adani Power & Tata Power. As far as comparison to China is concerned; Mundra’s SEZ model seems to be very similar to China, the basic difference being that in China, it is government induced development while in India it is private sector induced development with approvals to be sought from the government. India has sector specific SEZ. SEZ’s can be developed in smaller land volumes. In short, sustainable development of SEZ in India is feasible. Can you shed some light about Adani Power and why the Adani group entered this space? What is your view on the power sector in India? Adani power is a multi location power generation & transmission company that is currently engaged in developing coal based power plant aggregating over 13000 MW with a vision to develop 20000 MW power generation capacity by 2020. The firm’s power plants are located at Mundra and Dahej (Gujarat), Tiroda (Maharashtra), Kawai (Rajasthan), Chhindwara (Madhya Pradesh). I would say that we ventured into power generation and power transmission to form a complete value chain. Adani group sees great value proposition in entering this space. Let’s take a look at some macro variables relating to the power sector in India. The nation has suffered from an Avg. Peak Deficit of over 13% for the last 5 Years making it one of the lowest per capita consumers of power. Only 50% target has been met in the last three 5-year plans. This is where the Adani group feels it can make a difference with its logistics and connectivity: Ports, rail and road linkages, SEZ status at Mundra and the fact that it is one of the largest power traders and coal importers in India. The power sector in India is poised for growth with a number of projects in the pipeline. The Existing scenario in the power sector is such that there is an installed capacity of 148 GW with thermal power grabbing the lion’s share at 64%. (Hydro – 24%, Nuclear 3% and Residual 9% make up the rest). Per capita consumption of power stands at 618 KWH while the nation added 30 GW in the last 7 years. Going forward, India needs to add 78 GW in this 5 year plan and a further 80 GW in the following 5 years to satisfy the needs of the booming economy and population. The planning commission of India has set aside an investment of $166.63 billion for this purpose by 2012. What are some of the fastest growing industries/sectors in India? What are some of the main challenges in starting a business in India? There are a myriad of challenges to opening a new business in India but some of the more common ones include land acquisition, environmental clearance, intellectual property rights, and achieving economies of scale. Where does the Adani group see itself in the future? Which sectors do you plan to target? 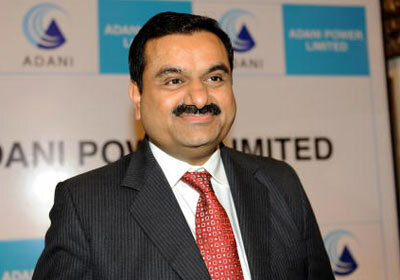 The Adani group will focus on the Power, Logistics, Mining, and Agro businesses. The current economic climate in India (growth rates of ~ 7.5%) along with a promising future outlook for infrastructure led development (Investments in infrastructure doubled from 4% to 8% of GDP over the past 5 yrs per Planning Commission) makes it conducive to enter these sectors. There has been a huge deficit and demand supply gap in key infrastructure sectors. Adani Group’s proven track record to envisage and implement are the key drivers in us entering these sectors. These new ventures complement our existing group businesses. We feel that by forming vertical and horizontal integration in respective value chains we can not only grow but also diversify our businesses. Where do you feel the overall Indian economy is headed in the coming years? The India growth story will continue. India’s GDP is likely to grow at an average 12% in nominal terms and the nation should be a $2-trillion economy by 2014-15 with savings of about $700 billion, leading to a marginal increase of 2% in the Savings to GDP rate, from existing 33%. Growth will be led by the huge consumption demand in sectors like Infrastructure (Power, Ports, Cement, Steel), FMCG, Auto (small car hub), IT/ITeS and Pharma.